We’re quite excited to see our ideas illuminating the blogosphere this week — thanks to Kat at Eating Liberally who wrote an eloquent and hopeful post about us called “The Greenhorns: A New Breed of American Idol?,” you can find news about The Greenhorns on The Huffington Post. It shows how our work — uniting young people, farmers, and foodies in the agrarian revival that so many young farmers and artisan foodmakers have already started— is an idea the mainstream media is attracted to. It’s no surprise to us, of course, because the movement we’re broadcasting is good– it tastes good and it feels good. Bonnie at The Ethicurean, a California-based food blog, also shared some kind words about the promise of the film. We hope that this news will reach those who might consider donating to the film. We’re trying to raise a few thousand dollars now to enter a short into the Bologna Slow Food Film Festival, but it takes much more than that to make a feature film! We believe in the power of what we are doing to inspire a generation of hopeful agrarians. 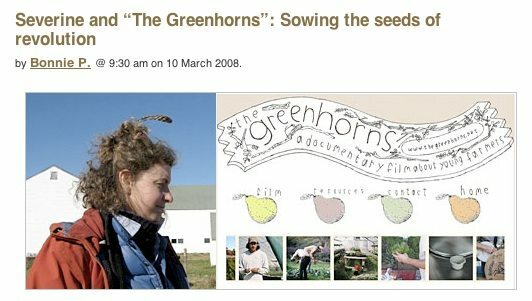 When people watch our trailer, they are inspired by the lives of greenhorns — young people working hard, experiencing the gratification of good work, reaping the generosity of the soil and feeding their neighbors with it. They are serving their country; they are embedded in the land; they can keep us safe and self-sufficient; and they re-constitute threadbare communities. Our job as film-makers, cheerleaders, and champions is to show the lives of these valourous agriculturalists and to entice others into the sector. Imagine the power a film can have to draw young people into such fulfilling livelihoods or lifestyles. Imagine more farms, more farmers, more good food. These are our hopes for the agrarian revival. If you would like more information about donating to this cause, please contact us at farmer@thgreenhorns.net.